Ray Dalio is one of the world’s most successful investors and entrepreneurs. 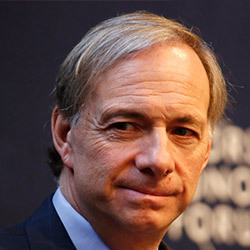 He’s the founder of Bridgewater Associates, a global macro investment firm that he started in 1975 and turned into the largest hedge fund in the world (manages $160 billion). Dalio is also the author of the bestseller “Principles: Life and Work”, released in 2017, where he shares the unconventional principles that he’s developed and refined in the past 40 years to create unique results in life and business. This is probably the most popular Ray Dalio book to date. He’s an active philanthropist, participant in The Giving Pledge, along with Bill Gates and Warren Buffett, a lifetime commitment to give half of his wealth to charity.